My change of guitars also marks a return to D'Addario strings. Over the years, I've tried many different brands of electric guitar strings. Everything from Fender to DR to Dunlop to GHS to Rotosound to Dean Markley to Darco to Ernie Ball and more. Heck, I even tried Alice brand once. However, the string that has always been around ever since I started playing guitar was the D'Addario XL. After not using them in a really long time, I've gone back to it being my main string. Why did I switch back after not using them for so long? My #1 complaint about D'Addario strings was that they always felt too tight at standard pitch. The wound strings have a hex core which does add in string tension, and the plain strings always had a more taut feeling to them. ...but then I started playing Ibanez guitars. On the Telecaster with its 25.5" scale length, the Boomers were great. No complaints whatsoever. But when I installed a set on my Ibanez with its 24.7" scale, it wasn't the same. Both the feel and tone were different to the point where it bothered me. 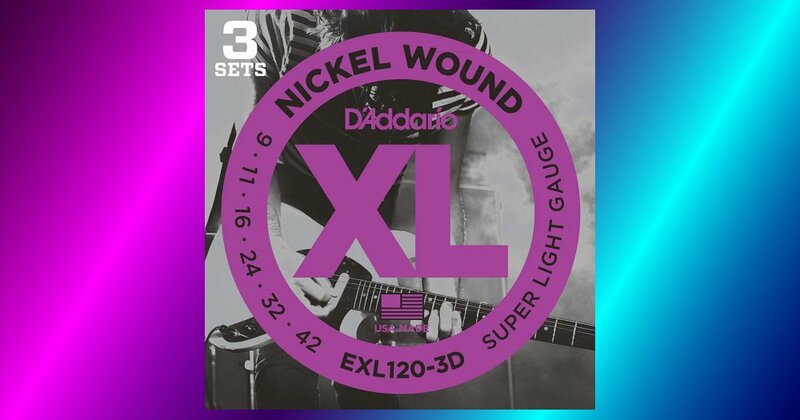 I figured I'd try a 9-42 set of D'Addario XL strings again, did so, and for the first time ever, they finally felt and sounded right. Going from a 25.5" to 24.7" scale length guitar loosened up the string tension at standard pitch enough to where I could now use them. Was the scale length the key to everything? The looser tension helped out a lot. But what also helped out are two other things. Fretboard radius and going back to a top-loader guitar. The fretboard radius on my Ibanez AX guitars is 12-inch. This does not affect string tension but does affect how much I can lower the strings to the fretboard. The flatter 12-inch radius does allow me to set strings closer to the board compared to the 9.5-inch. This means I don't have to press as much on the strings to fret notes and chords. When it comes to top-loader vs. string-thru, this is where things get weird. In my experience, top-loader guitars have less string tension compared to string-thru-body, even on guitars of the same scale length. They shouldn't, but my fingers tell me otherwise. I may and probably will write a full article on this later, as it is worth talking about. If you experience wrist strain or the strings you use just don't feel right, try different strings. Use whatever is available and accessible to you. If that means going through $50 worth of strings to find that one string set that really works well for you, do it. It is money well spent. And if after that you still don't get the right feel, switch guitars. But don't think that buying an expensive guitar gets you something better. That rarely works. Pay more attention to things like scale length and guitar body style first. Once you find something that works for you in cheap form, then you can go for a more expensive model and know you'll enjoy it. For example, the Ibanez AR725 is basically a very ritzy edition of the AX120 I own. It is good to know that since I get along so well with the AX120, the AR725 would be an enjoyable instrument to play and the money wouldn't be wasted.